The Russian myth of the Third Rome grew out of the fall of Constantinople to the all-conquering Ottoman army in 1453. In 1510 the monk Filofei wrote to the Grand Duke Vasili III: “Two Romes have fallen. The third Rome stands and there shall be no fourth.” Recently, during the usual falling out between various Orthodox priests and patriarchs, the theory was denounced but the Russians do not really care. Moscow remains the third Rome. After all, the Russians never did get Constantinople though given the number of them who seem to be domiciled in Istanbul one wonders whether they are using a different method to the same end. All this is a preliminary to a paean of praise by Tory Historian to the city of Istanbul, known for many centuries as Constantinople, the second Rome. It is not a city that buzzes nowadays though the melancholy mentioned by Orhan Pamuk is not exactly discernible. 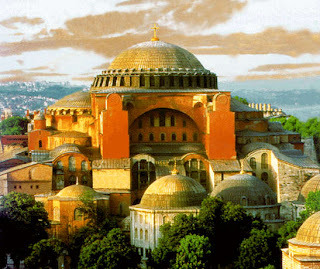 Quite simply, Istanbul is what Vienna was in the twenties and thirties – an imperial city that has lost its role. When, in 1923, the Turkish Republic was formed, Kemal Atatürk was so anxious to break with the Ottoman past and to create a new, secular state that he settled on a new capital, Ankara. For the first time in many centuries Constantinople was not the heart of a great empire (though Byzantium was considerably less than great by the time of the final conquest in 1453). It is taking a long time for the city to come to terms with that but it is also taking a long time for Turkey to settle down with its own Turkish identity, no matter how strongly people feel it inside them. The uncertainty over the mildly Islamist party taking power and the whole row over the Armenian massacre of 1915 are evidences of that uncertainty. One must wish Istanbul well because it is such a glorious and fascinating city. Surely, it will reacquire a role for itself but there is no doubt that its role is tied in closely with Turkey’s ability to define more securely her identity and her own role in the world. In that, too, one must wish the country well. It is, at present, the one fully secular Muslim country and if that experiment fails, there is little hope for peace between Islam and the West. Of course, one could argue that there was rarely peace between Islam and the West and why should there be. In the meantime Istanbul is extraordinary in the way one can quite literally walk though several centuries in one afternoon’s progression through the city. There are slums of the kind one would see in Third World countries cheek by jowl with highly respectable middle class areas that remind one irresistibly of Eastern and Central Europe. The public transport is excellent and the food is uniformly superb whether it is a borek-seller in a street or a restaurant that boasts of its “Ottoman” food. Antiquities, whether Byzantine or Ottoman have not been well preserved though efforts at restoration are being made and clearly there is a renewed interest in the city’s pre-Ottoman history, which is all to the good. Functioning mosques are beautiful and well-kept as well as surprisingly welcoming, something not a few tourists seemed to abuse. Courtesy requires that one obeys the rules of the place of worship one visits. If women do not like wearing headscarves they do not have to go into the Blue Mosque. Tory Historian’s abiding memory is sitting outside a Greek monastery (not functioning but relatively well preserved, drinking coffee and looking at the Turkish flag flying proudly as at four o’clock the muezzins began their call for prayer (largely ignored by the population at large). Oh well, of course, there is the other abiding memory of discussing Anatolian rugs over a little glass of chai in the Grand Bazaar. "Confessions of a speech-maker and speechwriter"
"The history of the Carlton Club"
October 12 seems to be a particularly sombre day. Looking at the BBC site "On this day" we find that this is the day on which the USS Cole was attacked in 2000 and the Bali nightclub explosions killed dozens of people. Though the number of casualties was smaller, in many ways for Britain the biggest and most horrific anniversary is that of the Brighton bomb in 1984. Aimed to kill the Prime Minister and any member of the Cabinet that got in the way, it did kill 4 people and injure many more, some, like Lady Tebbit, permanently. Miraculously, the Prime Minister survived and came out to address briskly the assembled media. It was a frightening day for many of us. It only needs to be added that the perpetrators were caught, tried and sentenced only to be released as part of the dubious peace process. On a more cheerful personal note: Tory Historian will be away for a week or so, visiting Constantinople or Istanbul, depending on which bit of history you happen to approve of. Tory Historian has been reading about social mobility in Victorian England. The book in question is Kathryn Hughes’s biography of Mrs Beeton, author of that famous cookery book and manual of domestic arrangements. It seems to have been one of those biographies that Eng.Lit. reviewers liked more than readers if the comments on Amazon are anything to go by – lukewarm at best. This decision of friends and neighbours to send their daughters to the same school on the other side of Europe might seem quaint to modern eyes but it made sense. She then proceeds to enumerate the various ways in which it made sense and, indeed, she is right: it did make sense. But there is a great deal too much of this condescension at the expense of the early Victorians and inhabitants of early nineteenth-century England with too many comments about how odd it must all seem to modern eyes. One must assume that a person who has decided to read about Mrs Beeton is not going to be too astounded by the fact that the world was a somewhat different place 150 or 200 years ago. Speculating on what the girls might have been doing when they were not being put through their severe curriculum, Ms Hughes surmises that they must have spent their Sundays trailing up to the castle. Um, maybe. Then again, they may have gone to church and for walks or done botanizing – a favourite occupation of the time – or allowed out to the town’s cafes under proper chaperonage. Who knows? Is there really any need for the following piece of padding? In the midst of all this chocolate box prettiness it is worth remembering the odd fact that by the time the last of these quaint young ladies had died – Isabella’s sister Esther Mayson, as it turned out, in 1931 – Hitler was only two years away from becoming Chancellor and the infamous Nazification of Heidelberg University was on its way. Actually, it is not worth remembering at all in the particular circumstances of trying to understand how several Victorian families chose to educate their daughters. The chocolate box prettiness is introduced quite gratuitously by Ms Hughes and the young ladies in question can be regarded as quaint only if we take the rather bizarre view that whatever we see around us at this moment is the absolute norm. Surely, no historian or biographer can think that way. Tory Historian is beginning to think that the ordinary commenters on Amazon were nearer the mark than the EngLit critics in the various newspapers and magazines. As to the theory, based on Nancy Spain’s guesswork that Sam Beeton probably had syphilis and infected his wife on their honeymoon – Tory Historian has not read far enough to find out how well founded the guess is. Of greater interest are the early descriptions of the various parts of Isabella Beeton’s family – haven’t reached Sam’s yet – rising rapidly through early Victorian society in a way that would have been very difficult at best in a pre-industrial age. Isabella’s grandfather, the Rev. John Mayson was an intelligent son of a farmer who was educated at school till the age of 14 and then somehow (he is lost from sight for many years) managed to become a curate. At that position he stayed for most of his career because of lack of social contact and, presumably, formal education. He became a vicar towards the end of his life because the man at whose disposal the living was temporarily had no member of the family to whom he could give it. John Mayson’s surviving son Benjamin, on the other hand, made a spectacular career through the cotton industry, becoming a well-off warehouseman and agent in the City of London. Had he lived longer he, too, would have been able to give his children a very good education. Elizabeth Jerrom, the woman whom Benjamin Mayson would marry, was born on 24 May 1815, three weeks before the great victory of Waterloo. Her parents Isaac and Mary were domestic servants working for one of the big houses around Marylebone, part of the feverish development of gracious squares that had been built towards the end of the last century to house the newer aristocracy during the ‘London’ part of their wandering year. When the couple had married eleven months earlier at St Martin-in-the-Fields, they had signed the register clearly, confident in themselves and their new merged identity. The same, though, cannot be said of their witnesses. William Standage, Mary’s father, has done his best but the sprawling scratch he makes in the register is indecipherable: underneath the parish clerk has been obliged – tactfully, crossly? – to write out his name properly, for the record. Mrs Beeton is only twenty years away from people who would have been happier signing themselves with a cross. William Standage was, in fact, a highly prized and very well paid groom to the Duke of Richmond and horses figure a great deal in Isabella Beeton’s family. Isaac and Mary Jerrom did very well in the changing new world that Ms Hughes is slightly disdainful of (clerks and shop girls careering round the City in cabs – faugh!). Isaac kept a livery stable, hiring out horses and coaches to those who could not afford their own and ran a hackney cab business. Mary ran a respectable lodging house – a not infrequent combination at the time, which made a good deal of sense. Elizabeth Mayson was widowed young and, left with four small children, she married a close friend of the family, whose own wife had died some months previously in childbirth (an all too frequent tale). Henry Dorling was second generation of an upwardly mobile family. His father William had moved his small printing business from Bexhill to Epsom, where he gradually expanded it and took over more and more of the town and its biggest business, the annual Derby Day race, in the process cleaning up what was a financially and legally dubious business before that. Henry Dorling continued in his footsteps, gradually becoming the most important man in the town and almost the sole controller of the Epsom race course. The fact that he could spend a good deal money on the education of his daughters and step-daughters as well as the boys in the family attests to his wealth and his imagination. There are many other interesting details about the various families in the book, which Tory Historian does recommend, despite the author’s irritating habits. What is worth remembering as one reads through this early whirlwind activity and social mobility is that Isabella Beeton’s journalism in the “Englishwoman’s Domestic Magazine” and other periodicals as well as her monumental “Book of Household Management” was meant for people like her and her family: upwardly mobile, perhaps a little uncertain of their social position, in need of guidance as to how to behave and run a household.